Representatives of campus publication the Berkeley Patriot have informed UC Berkeley administration that all of the events scheduled for the upcoming week have been canceled, according to campus spokesperson Dan Mogulof. In his email, Mogulof called allegations that UC Berkeley administration wanted the four-day-long event to be canceled “without basis in fact.” Mogulof added that UC Berkeley was in the process of allocating more than $1 million towards security for Free Speech Week. Yiannopoulos held a live press conference Saturday morning on Facebook, during which he announced that although the Berkeley Patriot has pulled out of Free Speech Week, he has not. He said during the conference that he and some of his scheduled speakers, including Pamela Geller, Mike Cernovich, Lauren Southern, Sabo and Lisa De Pasquale, will be on Sproul Plaza on Sept. 24 at noon to speak. He acknowledged that without the Berkeley Patriot’s support, it will be an “unofficial” event. Neither Ann Coulter nor Steve Bannon, both of whom were expected to attend Free Speech Week, will attend the event Sept. 24, according to Yiannopoulos. He said at the conference that he will be rescheduling Coulter and Bannon for a later date. Yiannopoulos also announced at the conference that the Mario Savio Award for Free Speech — which he had planned to award to one of the speakers at the end of Free Speech Week — was originally going to be awarded to Coulter. Since Coulter will not be attending the Sept. 24 event, Yiannopoulos said that he considered destroying the award publicly to make a statement. Mogulof and UCPD Chief Margo Bennett held a press conference Saturday in response to media inquiries about the cancellation of Free Speech Week. At the conference, both Mogulof and Bennett emphasized that the campus and local authorities were still preparing for any kind of demonstration that might occur Sept. 24. Mogulof added, however, that the campus would not be releasing the details of its security preparations to the public. Bennett added that because Yiannopoulos will be holding his event Sept. 24 as a private citizen, there are some restrictions on what he can do — for instance, he will not be able to use amplified sound because he has not gotten approval to do so. During his conference, Yiannopoulos said he was “blindsided” by the Berkeley Patriot’s withdrawal from Free Speech Week. He alleged, however, that the blame for the event “lies squarely with UC Berkeley.” He alleged that the Berkeley Patriot was “bullied, cajoled, manipulated and intimidated” by the campus administration for holding this event. On Tuesday, the Berkeley Patriot filed a civil rights complaint against UC Berkeley administration for allegedly suppressing the organization’s First Amendment rights. “The situation at UC Berkeley has become downright physically dangerous this past year for conservative students who merely wish to exercise their God-given rights to freedom of speech and association that are enshrined in the Constitution,” alleged Marguerite Melo, one of the attorneys representing the Berkeley Patriot, in the complaint. At the conference, Mogulof said that the allegations regarding unreasonable deadlines were “utter nonsense,” emphasizing that the campus had spent “an incredible amount of time and energy” trying to organize these events over the last eight weeks. Yiannopoulos read out a statement from the Berkeley Patriot editor in chief Mike Wright at the conference, which alleged that after the Berkeley Patriot filed its complaint, the campus administration began an “extensive, co-ordinated campaign of harassment and retaliation” against its members in the form of an investigation into hate speech charges. He compared the campus’s alleged threats to the Salem Witch Trials. Wright also said in his statement that the Berkeley Patriot is in the process of filing a second complaint through the Department of Justice against campus administration. At the conference, Mogulof also emphasized that none of the students in the Berkeley Patriot are being considered for expulsion. 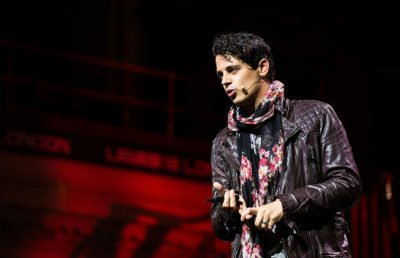 During his press conference, Yiannopoulos announced that he will be endowing the Berkeley Patriot with $10,000 — which he is calling the Mario Savio Free Speech Fund — to help “undo some of the damage done” to the student group’s reputation and help get its publication started. At his conference, Yiannopoulos also invited both Chancellor Carol Christ and UC President Janet Napolitano to join him in a debate any time in the next seven months. He said at the conference that although he was disappointed by their statements about him, he appreciated their funding efforts to uphold the First Amendment. 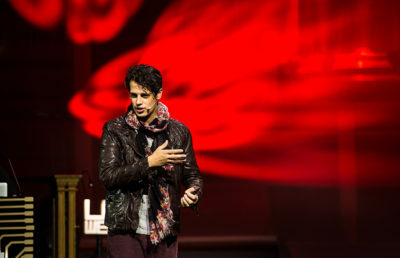 “It is high time that America had its big showdown free speech debate between the progressive liberals who believe that free speech is now just a cover for right-wingers to say awful things and conservatives who believe that their speech is being infringed upon … like never before,” Yiannopoulos said at the conference. At the conference, Mogulof also addressed rumors that Yiannopoulos did not plan to actually host Free Speech Week. He said at the conference that Lucian Wintrich, one of the speakers who was invited to attend Free Speech Week, emailed him and said that the events were “a set up” and organizers were planning canceling them. “There are a number of things that I’m sure you’ve all seen reported in the press that raise serious questions about whether there was ever actually plans or intentions to hold these events, or whether what we witnessed was a somewhat cynical effort to create a false narrative and score political points,” Mogulof said at the conference. Staff writers Sakura Cannestra and Adrianna Buenviaje contributed to this report.